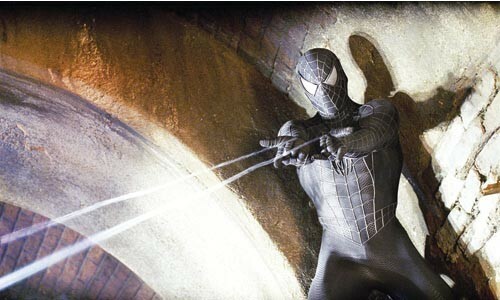 The quality of the merciless is rather strained in Spider-Man 3, the latest installment in the serially entertaining comic-book-cinema franchise about the heroic, arachnophilic, alliterate Peter Parker, portrayed once again by the perpetually puckish Tobey Maguire (with a name like "Tobey," will he ever not be?). In his first two adventures, Spidey faced villains portrayed by Willem Dafoe, who's monstrous even without makeup and a script, and Alfred Molina, an actor so good he could hold our attention watching paint dry. Both of these nemeses were, more or less, mad scientists. This time, though, Thomas Haden Church and Topher Grace play the bad guys, villains cut from the same quotidian cloth that led to Peter's transformation. It's a fair concept, and director/co-writer Sam Raimi chose actors suited (ha, ha, pun intended) to their roles: Church is a sad-sack escaped con with a dying daughter who morphs into an unstoppable giant sandman; Grace is Pete's photojournalist rival and fellow dweeb who becomes a fanged avenger after some symbiotic meteor goop drips on him. But somehow, no matter how you dress them up, it's a little hard to feel threatened by two notorious goofballs, especially when their names are Church and Grace. Fortunately, these supervillains occupy comparatively little time in the movie, which centers most of its conflict on our three central figures: All of New York loves Spidey; Pete is engaged to M.J. (Kirsten Dunst), who has the lead in a Broadway musical; and Harry (James Franco), still enraged with the thought that Spider-Man killed his father, sets out to kill the former friend whose secret identity he knows, and whom he believes made him an orphan. Plenty happens in S-M 3's two-hours-plus, most notably when Spider-Man succumbs to the meteoric symbiant, an organism that magnifies a person's worst impulses. So Peter becomes a foxy man about town, and Spidey goes over to his dark side for a while. How entertaining is this all? Sufficiently. After the first two films, it hardly seemed possible that the action could get better. But when Harry -- in a souped-up version of his daddy's Goblinwear -- goes after Spidey, high over Manhattan, it's pretty damned cool. There's plenty of teary camaraderie, too, as the boys work through their friendship and the lovers work through their relationship. Peter believes that people are all basically good inside, and that we always have a choice, even in a world of supernatural phenomena. "Where do these guys come from?" Spidey muses, after his first encounter with Sandman -- so there's some slightly self-aware humor, too. And yet, this installment feels superfluous to the earlier two: It should certainly be the last, although it certainly won't be. The only thing I took away from it was a reminder of how wide a range of talent Maguire has to accompany his immutable charm. He's a comic actor waiting to break out, and I hope he finds someone to let him do it opposite a leading lady who doesn't sound like she's perpetually getting over a cold.